Samsung M5370LX Monochrome Multifunction MultiXpress - Perfecta Business Services, Inc.
To stay ahead, it’s critical that businesses avail themselves of every advantage at their disposal. Samsung is dedicated to providing those advantages, year after year. With a focus on boosting productivity and efficiency through innovative technology, Samsung offers differentiated products and solutions. The MultiXpress M5370LX MFP, for example, incorporates a world-first Smart UX powered by Android. It’s innovations like this that have led to our A4 laser printers earning the No. 2 position in global market share, while our A3 MFPs continue their strong growth. The speed of business is constantly increasing, and to keep pace, more workplaces are embracing bring your own device (BYOD) policies. As smartphones, tablets and cloud computing in the office lead to more efficient, and seamless operations as well as highly productive employees, businesses want to extend that same smart technology to all devices. 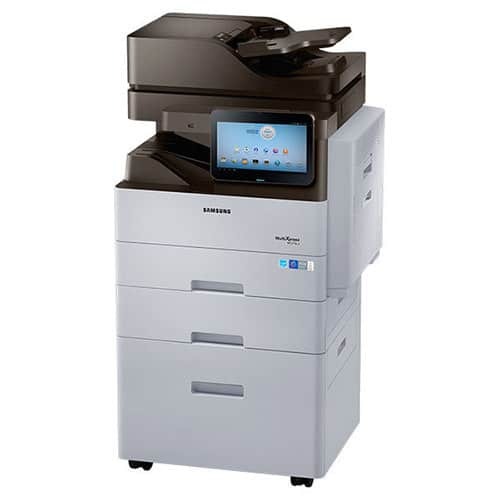 Samsung’s MultiXpress M5370LX MFP offers the interoperability of cutting-edge mobile devices in a print solution that can be easily managed, all while delivering powerful performance at reduced costs. The MultiXpress M5370LX MFP provides simple, innovative usability through the Samsung SMART UX Center, the very first UI (User Interface) powered by Android. These user-friendly interfaces provide intuitiveness, usability and extensibility. Open and edit documents right on the UI before printing. Usability can be further extended with the built-in Web Print Browser, which allows you to find and print content such as maps, pictures, e-mail and more, all without the need for a PC. Maximize ease of use by customizing the UI environment for each user with My Page or My Programs. It’s a virtual desktop set up with a user’s own wallpaper, apps and settings, ready whenever the user is. The UI also makes it simple to keep track of an individual’s usage, control accessibility and more. Administration can lock any type of widgets or functions.